Love is in the air and during this season, travelers across the globe are searching for the best romantic getaways in the Caribbean. While there are more than a few options, we know you deserve the best of resort experiences. Each of our resort selections include the primary ingredients; delectable cuisine, boutique spa treatments, fabulous amenities and an all-encompassing selection of things to do during your stay. But you and your significant other want something special. So we’ve curated a list of top resorts that cater to more than amenities and are inspired by the true essence of romance! 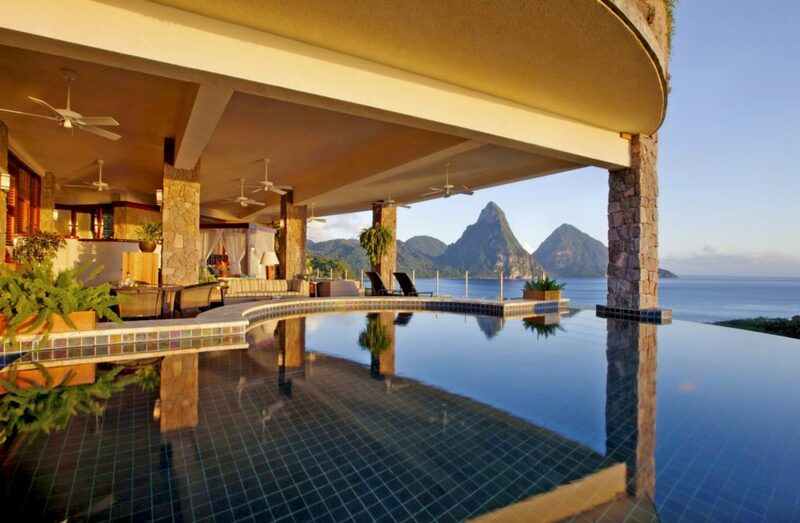 Named as the top Caribbean resort by Condé Nast for three consecutive years, the Jade Mountain Resort in St. Lucia is filled with enviable amenities that could only be found at a world-class property. 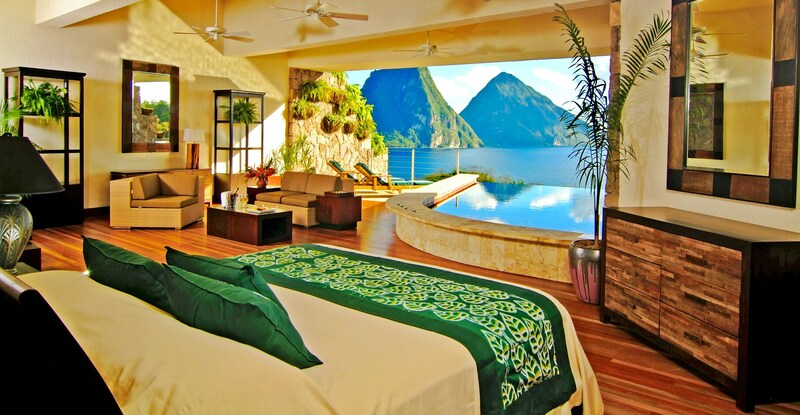 Transforming a luxury resort experience into a romantic escape where the unsurpassed beauty of the Caribbean and sophisticated architecture align, Jade Mountain is an idyllic dream brought to life against the backdrop of seemingly endless blue skies. As a reminder of the ascension into this secluded paradise, views of the famed Gros Piton and Piti mountains offer a sense of inspiration and awe while the infinity pool seems to effortlessly merge with the azure waters of the Caribbean Sea. Get closer on the Celestial Terrace to watch the stars dance in the night sky or unwind together on the silky sands of one of the beaches at Anse Chastanet, the partnering resort below Jade Mountain offering a plethora of additional opportunities for land and water adventure. 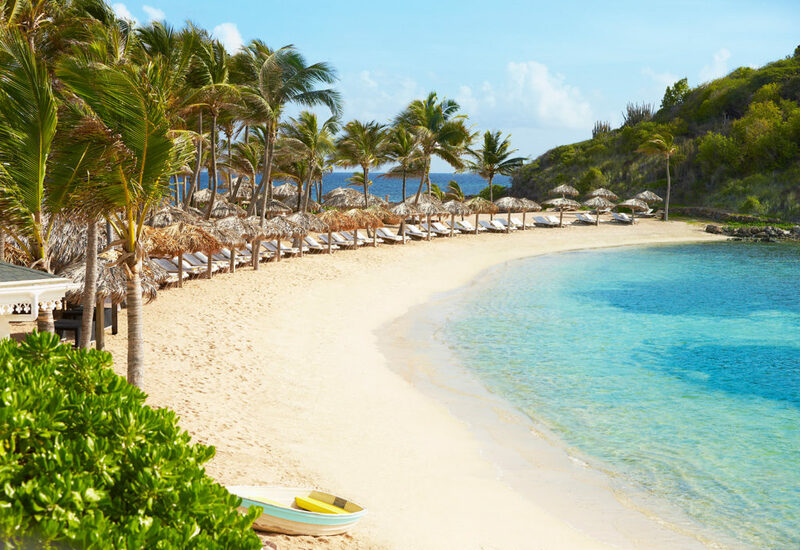 Resting on the peninsula in the Grand Cul-de-Sac of St. Barths, Le Guanahani is the perfect choice for family-oriented adventurers seeking privacy. Walking along the soft sands of the beach, couples feel as if they’ve been whisked away to the personal paradise of an exclusive community bustling with entertainment and demonstrating the gastronomic excellence that has become synonymous with St. Barth’s. With something for everyone at Le Guanahani, the possibilities for romance are endless. Walk hand-in-hand from your cozy, sophisticated cottage through the opulent gardens as you appreciate nature’s serenity and the simple joys of time spent together. Couples looking to bring the kids along will appreciate the Submarine Tours, a safe and memorable experience allowing for an educational and colorful glimpse of life under the sea. 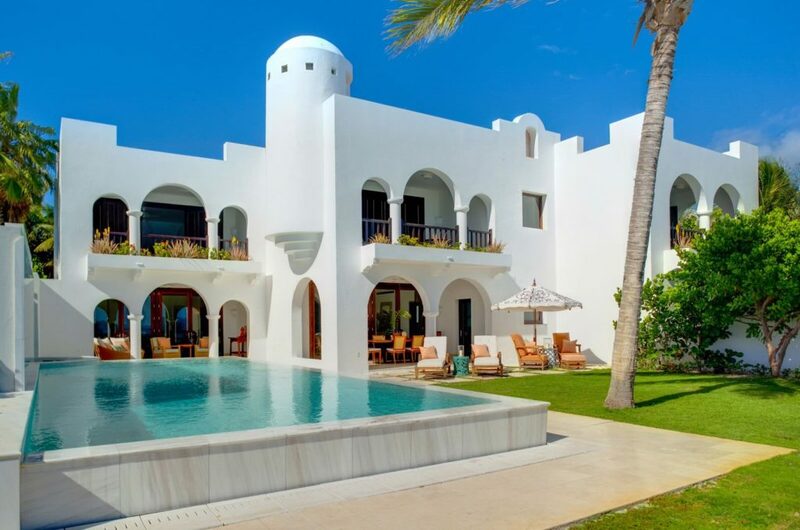 Cap Juluca displays mind-blowing architecture and boasts first-class accommodations along with savory, award-winning cuisine. 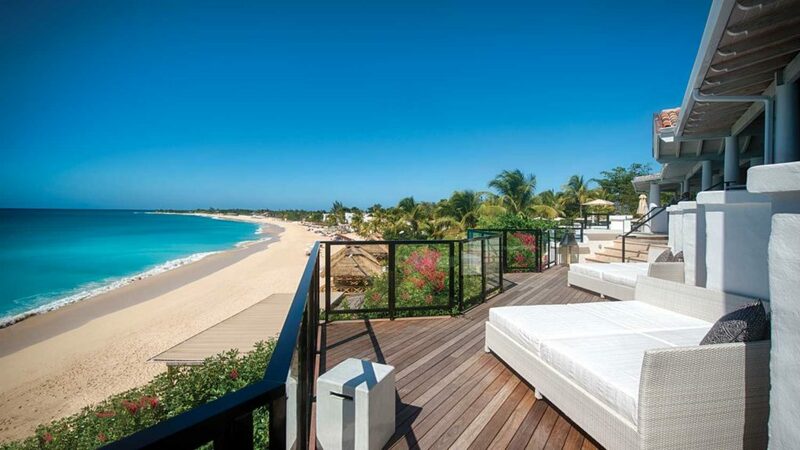 But, it’s the lure of romance and awakened passions that draws couples to this resort in Anguilla. 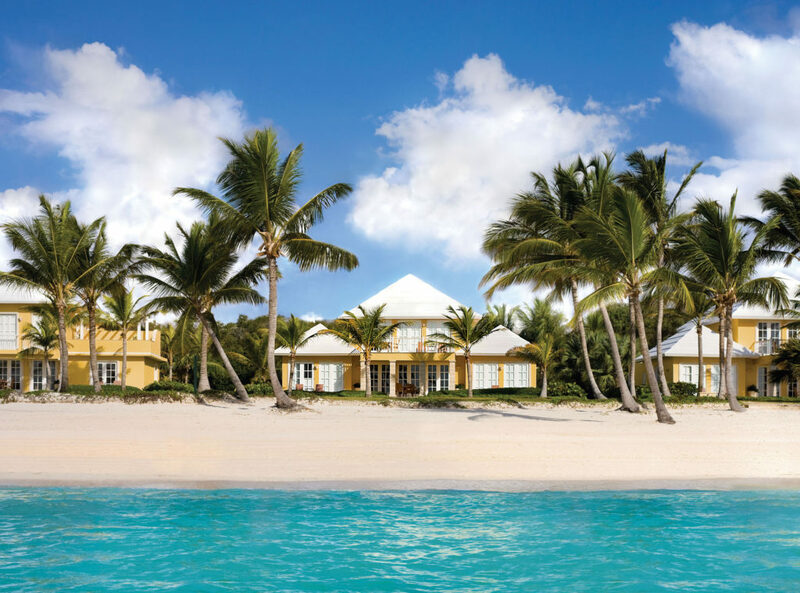 A world-renowned favorite, TripAdvisor has listed Cap Juluca as one of the top 10 Celebrity Honeymoon Hotels while Condé Nast selected Cap Juluca as the Most Romantic Hideaway for 2015. Lovers of luxury and white sand beaches won’t be disappointed. From the translucent waters that go on for a mile to the majestic mountains of St. Martin in the distance, you’ll be enraptured by the scenic splendor of this world-class getaway. Whether you’re tying the knot or strengthening the bond you already share, Cap Jeluca is the place to be for couples in Anguilla. Is it the music made by the Caribbean waves or the candlelit dinners at La Cave that make La Samanna so romantic? Or could it be the massages by the beach? With so many possibilities for romance, this resort had to make our list. Whether you’re enjoying tasty libations by the pool or wine from the acclaimed cellar (known for having one of the largest collections throughout all of the Caribbean islands), more than 50 acres of serenity are waiting to be explored. Authenticity and class are two of the main features that make this resort a standout in St. Martin as commercial tourism is exchanged for a cultural experience and unforgettable moments. 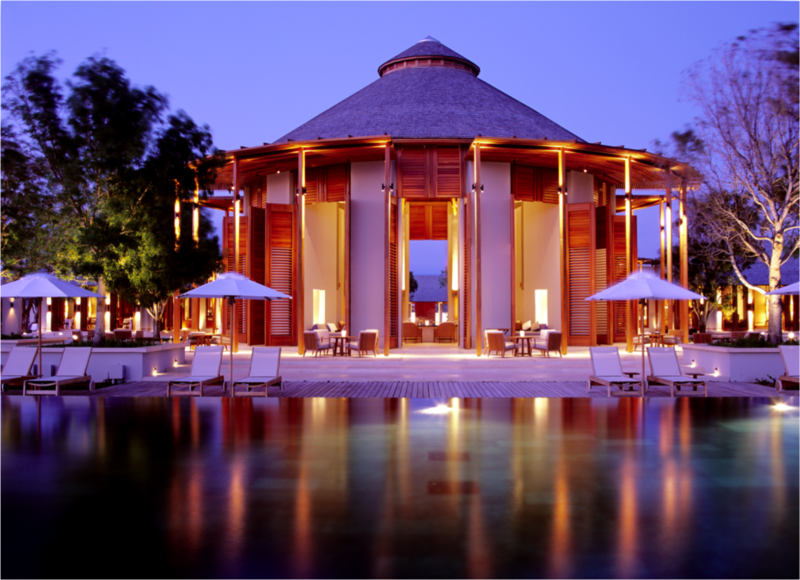 Indulge in the European-style spa treatment as a couple or sip cocktails at the infinity pool. No matter how you spend your time at La Samanna, the distractions of modern-day living will seem as if they’ve faded away, allowing you and that special someone to focus on what’s most important- your commitment to one another. The translation of the term Amanyara means “peaceful place,” and this resort has become a prime destination in Turks and Caicos for couples looking to escape modern inconveniences and constant worries. The design of Amanyara is inspired by grace and crafted with even the smallest of details in mind, culminating in an enchantment that arouses the senses in a way that often leaves guests speechless. The subtle power and instinctive beauty of water is a theme embraced throughout the resort. You’ll find gently flowing ponds and infinity pools that appear as if they truly go on forever. Outdoor lovers are in for a special treat at Amanyara thanks to the abounding natural beauty and tranquil Caribbean waters made for underwater adventures and sightseeing. By the way, you don’t want to miss the sunsets at Amanyara as the sky is illuminated with heartwarming and fiery colors. Featuring the iconic design of Oscar De La Renta, Tortuga Bay is the destination for trendy couples in search of fine dining and the Caribbean luxe life while in the Dominican Republic. Paying homage to Dominican culture, the 6 eateries at the resort offer an impressive and diverse culinary experience. From mesmerizing views of the Caribbean Sea to the stress-relieving massages offered at the Six Senses Spa, you won’t soon forget your time spent at Tortuga Bay. As seen in Ocean Splash Magazine.